I am always good at finding the best places to eat, but when it comes to drinks, I am lucky to have a group of friends who are familiar with the Best Bars in Singapore. To most people, alcohol is very important, but I always prefer eating to drinking. Together with Cafe Fables and A Thousand Tales (vintage furniture store), Bar Stories is a funky bar nestled within a shop house in Haji Lane. Apparently Cafe Fables operates in the day, and it transforms into Bar Stories when nightfall arrives. 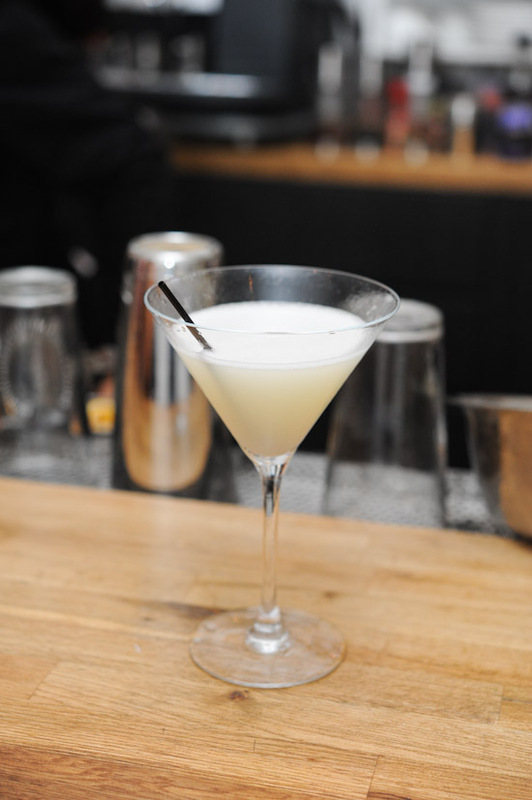 Depending on individual preferences, the mixologists will create different cocktails right before your eyes. It was very interesting to watch them prepare each drink with different ingredients and liqueur – it felt like watching a performance. The drinks at Bar Stories are very unique, and quite unlike the usual ones that you get from other bars. They use fresh food for every cocktail, so there is no artificial colouring. I was tempted to reply “surprise me” when Jeff the mixologist asked me to make my order. Since it was my first time there, I decided to play safe and told him I like anything-sweet. He whipped out the Honeydew Sake Martini ($22, see above picture) in an instance, and I really enjoyed it. My friends had the Midori Sour ($22) – a gorgeous shade of light green, pretty to look at and pleasant to drink; the Absinthe Forward Martini ($25) which had a heavy dosage of Absinthe & Gin and smacked us right in the face; and the Kyoho Grapes Martini ($25), a cheerful red mixture that made us rather gigglish. I don’t know about you, but pretty colours always make cocktails nicer to drink. Tell me your life stories and I’ll buy you a drink. There is really nothing like a good cocktail after a long day of work. Have you been to Bar Stories at Haji Lane? What is your favourite drink there? I’ve only been there in the day. The drinks look interesting, will have to pay it a visit at night soon. Their sorbet mojito is definitely the best. sounds good! gg there this fri..Need to make reservations? i am gg with a grp of 6..
michelle: I’m not sure if they take reservations, you can try calling? The strawberry shortcake with hazelnut sirop! Feeling that you’re eating a cake!!! Awesome! You should ask Jeff to make an apple pie martini. Really good stuff. But it’s on the list of things you cannot order on Fridays and Saturdays.